Testimonials from Parents and Rasikas(audience)! Wonderful teacher you would never imagine. You are blessed if you get to be under her guidance. - Hema Maarimuthu, Adult student, Parent of Srinidhi & Sri Siva. Bhuvana Venkatesh is a passionate, dedicated and gifted teacher who strives to instill the values of hardwork and perseverance in her students through her teachings. Being a wonderful choreographer and dancer, she inspires her students to love and appreciate this artform of Bharathanatyam. My daughter has been learning from her from 2012 and looks forward to her classes with great enthusiasm. Her unique style of teaching is always combined with a song which makes the session very interesting for her students and they thoroughly enjoy the classes. - Jayashree Sampathkumar, Parent of Vishaka. My daughter has been learning the Bharathanatyam dance form since 2012, under the guidance of Smt. Bhuvana Venkatesh. Throughout this journey, Bhuvana Venkatesh has been instrumental in guiding, nurturing and training my daughter , along with her other students with great patience , perseverance and passion. My daughter has performed at several events as part of the dance group and this has not only instilled confidence and growth in her abilities but has also infused a great sense of enjoyment in her performances. I will highly recommend her as a dance teacher to whomsoever is interested in learning this art form. - Ashwini Ajay, Parent of Anika. Bhuvana Venkatesh is a dear friend , amazing Bharathanatyam dancer and a wonderful teacher. My daughter has been learning from Bhuvana for the past 3 years. Bhuvana's teaching methodology is unique. Her students learn basic steps through small songs and they are trained to express themselves through physical gestures and facial expressions from early on. Bhuvana teaches in Evergreen area of San Jose. She teaches boys, girls and adults. - Madhu Krishnan, Parent of Varshini. 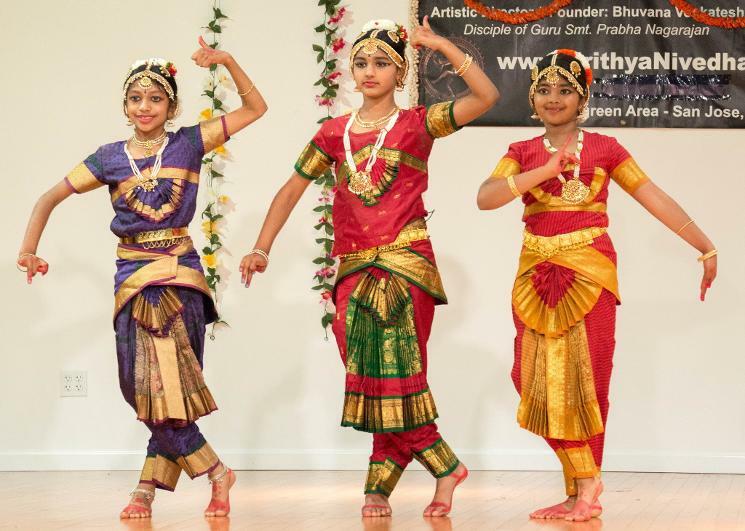 When it comes to Indian classical dance, Bharathanatyam, Bhuvana Venkatesh is a well-known name in the Bay Area. My daughter has been learning from Bhuvana since the age of 5 and developed interest in this dance merely due to her unique teaching methodology. Her students learn basic steps through small songs and they are trained to express themselves through Physical gestures and facial expressions from early on. Her teaching style instills confidence, discipline , self-control and a positive image on one's physical and mental capabilities! Bhuvana teaches in Evergreen area of San Jose, however she has students coming from Cupertino , Sunnyvale. Also she teaches all gender from kids to adults. - Priya Nagarajan , Parent of Nandhini. A dedicated, passionate Indian classical dance teacher. My daughter learns dance from Bhuvana. I can see the perseverance and dedication building in her from the teacher. I will definitely recommend Bhuvana for learning Bharathanatyam. - Kavitha Tholkappian, Parent of Poongudi. My daughter is currently learning Bharathanatyam. Bhuvana is a dedicated teacher and my daughter is learning and improving by the day. - T. Srinivas, Parent of Meera. A wonderful and dedicated teacher to learn the classical dance. I have been to many of her students and also her performance, and everytime I absolutely love her unique style of dance. - Deepa Prabhuram, a rasika & a good supporter of Nrithyanivedhan School of Dance events.